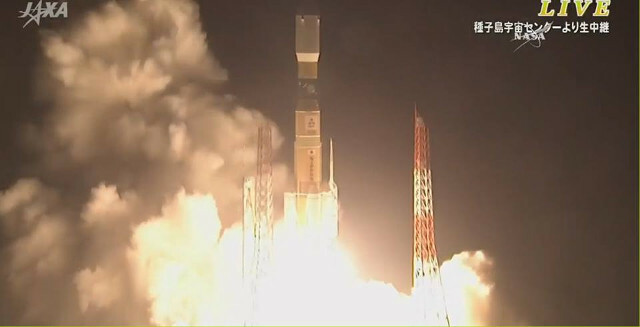 The HTV-5 (H-II Transfer Vehicle) spacecraft was named Kounotori, meaning white stork. It carries a total of about 5.5 tons (more than 8,000 lbs) of cargo to the International Space Station between the pressurized and non-pressurized sections. Thanks to its high capacity, it was possible to fill it with supplies such as water and food for the crew for them to have a stock for at least six months, but also new instruments, experiments and various hardware. The failure of three resupply missions in less than a year worried the International Space Station’s partner nations because they want to avoid risks to the crew. It was possible to send to Japan replacements of some components important for the maintenance of the Station destroyed along with the latest Dragon and Cygnus spacecraft. A good part of the cargo consists of a number of instruments for investigations of various types. There’s the CALorimetric Electron Telescope (CALET), an instrument for an astrophysics investigation looking for signs of dark matter. There are 12 Mouse Habitat Units (MHUs) to study the health of mice in microgravity. There’s the Electrostatic Levitation Furnace (ELF) to study the melting of materials at very high temperatures in microgravity. In addition to these and other big instruments, in the cargo there’s a series of CubeSat-class nanosatellites, now common in all the launches of space cargo ships. There’s a series of the ones called Doves, which already form a constellation with the purpose of taking images of the Earth. There’s also ESA’s GOMX-3, which aims to experiment new miniaturized technologies to monitor satellites communications and air traffic. The arrival of the spacecraft HTV-5 to the International Space Station is scheduled for next Monday, almost at 11 UTC. It will be captured by the robotic arm, like the Dragon and Cygnus. After the incidents that happened in recent months it’s important to try to get back to a routine.